£250 bonus once you have worked 200 hours (within 6 months of clearance). FREE uniform and FREE DBS Check worth £64. Offer valid for new registrations and returning nurses who have not worked for Swanstaff for at least 6 months. Don't qualify? 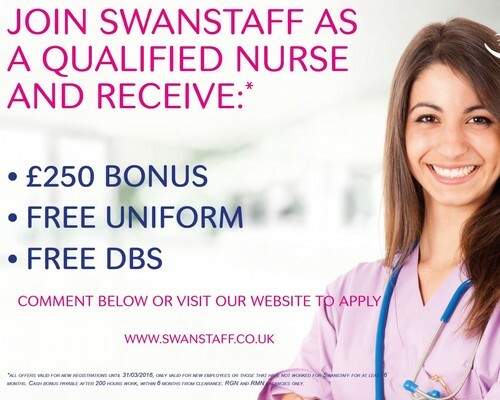 If you already work for Swanstaff you can refer a friend and receive up to £200 bonus once they work 100 hours (Nurses £200, HGV Driver £150, 7.5T £50, HCA/3.5T or Warehouse operative £25).